The issue of on-street parking affects almost every resident in our area. There is mounting pressure on the available parking in our roads and streets. ​This has recently become worse due to the introduction in August 2017 of new Parking Permit Schemes in nearby areas such as Lansdown Crescent and Christchurch areas of Cheltenham. The building of substantial numbers of new houses on the outskirts of Cheltenham will also create yet more pressure on parking. We are now one of the few areas in the central area of Cheltenham where unrestricted parking is still available. 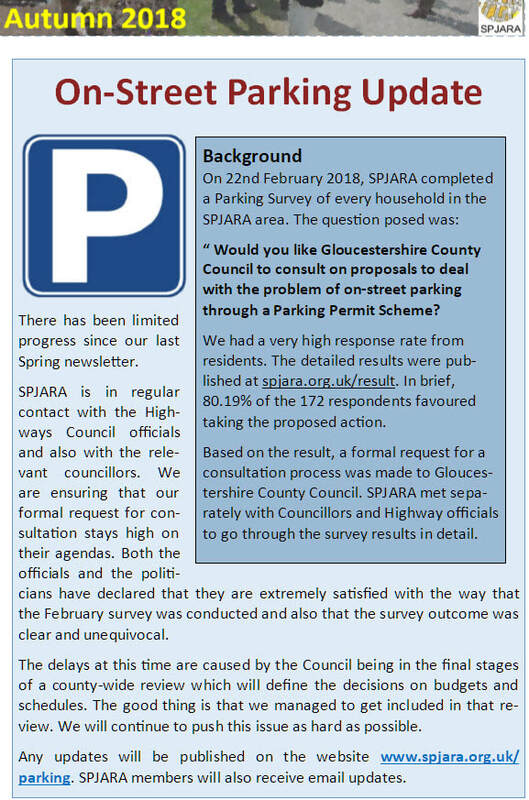 We realise that on-street parking is a potentially divisive issue, but we feel it is part of SPJARA’s role to assist in finding the best solution. Crucially, SPJARA will play an active but entirely neutral role in this exercise. Specifically, we will seek to use these pages to display the hard facts about the problems residents face and the various solutions. ​These pages can then act as a store of such facts so that misinformation can be avoided and everyone can agree about the facts at least! When all the solutions are clear and documented, we will devise a suitable method to ensure that every resident can tell us which solution, if any, they would most like us all to pursue.